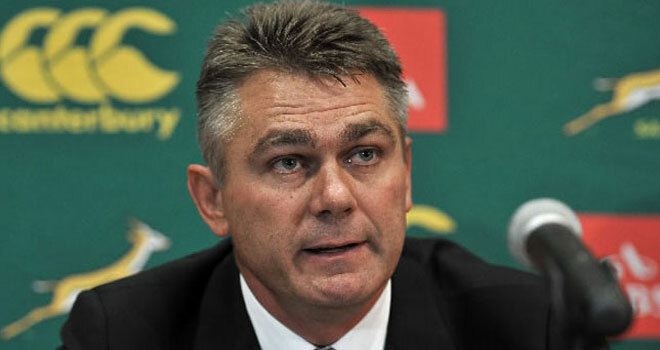 Is it fair to expect Heyneke Meyer to fall on his own sword after the Springboks won the Bronze medal at RWC 2015, or should that decision be made for him by the authorities? If the figure of a R5 million per year contract is correct, I would certainly try and hold on for dear life if I was him, but, honestly, that is not the calibre of man that he is. If he was not convinced that he can still play an important part in the future of Springbok rugby, he would have resigned. Therein lays the problem, though. One cannot fault his passion or determination, but if that causes him to stick resolutely to an outdated game plan for four years, simply because he believes in it, then I’m afraid nothing much will change in the next four years either. An opinion was expressed that a national coach should be appointed for a four year term – two years prior to the World Cup, and two years after that to build on what was learnt during the World Cup. I do not agree. Michael Cheika picked up a down and out Australian side and transformed them into RWC 2015 finalists within 12 months. The question is: are there more Cheikas out there? A number of international sides, including Wales and Ireland, employed New Zealand born and bred coaches very effectively to lift them from also-rans to Six Nations glory. Gone are the days of English dominance. Sadly, this will not work for South Africa. At least we have progressed from the days where it was a requirement for the coach to be an ex-Bok to the realisation that good players are not necessarily good trainers. Then, of course, there are the unique South African conditions which a foreigner will find hard to adjust to. Forwards: Tendai Mtawarira, Trevor Nyakane, Steven Kitshoff, Jannie du Plessis, Frans Malherbe, Coenie Oosthuizen, Bismarck du Plessis, Adriaan Strauss, Scarra Ntubeni, Victor Matfield, Eben Etzebeth, Lood de Jager, Pieter-Steph du Toit, Duane Vermeulen, Willem Alberts, Francois Louw, Schalk Burger, Siya Kolisi/Oupa Mohoje. Backs: Fourie du Preez, Cobus Reinach, Faf de Klerk, Handre Pollard, Pat Lambie, Elton Jantjies, Jean de Villiers (captain), Damian de Allende, Jan Serfontein, Bryan Habana, JP Pietersen, Lwazi Mvovo, Willie le Roux. Would these players have fared better? It is impossible to say, but more intelligent application of various players would have made a difference. I would also suggest that allowing the likes of Damien de Allende and Willie le Roux to play their natural game, and employing a superior tactical kicker like Lambie, when Pollard was clearly not up to the task, would have made a difference. Ons het, met respek, dom rugby gespeel. As ‘n rugby genie soos Brendan Venter daar was, en sy lees van die spel aanvaar en toegepas is, het ons dalk vandag anders gevoel oor wat die afgelope vier jaar gebeur het. Daar is by my geen twyfel dat hy die mees logiese man is om Meyer op te volg nie. Toetie is nie so uitgesproke soos Mallett of Jake White nie, maar dit neem niks weg van wat hy vermag het by die WP nie. Voeg daarby sy ondervinding saam met Jake White en Eddie Jones in 2007, en jy sit met iemand wat in meer as een opsig die nodige vaardighede en ondervinding het om die Springbokke te laat opstaan uit die sak en as van die afgelope vier jaar. Vir eers moet ons fokus om die Rugbykampioenskap te wen. Dit was nog altyd die fondament waarop wêreldkampioene hul sukses gebou het. Meet jouself teen die All Blacks, en kyk wat jy moet doen om hulle te klop. 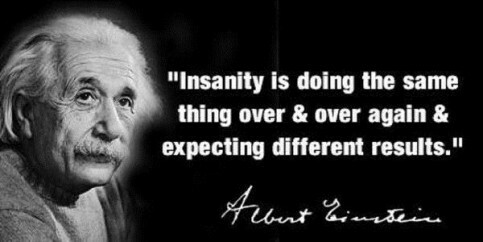 Of luister na Albert Einstein. By far the best article I have read on Heyneke Meyer’s performance was written by Liz McGregor: Click here for a really balanced perspective which proves that lady rugby writers are at least on equal footing with their male counterparts.